So, it's getting really, really hot here in Arizona. It's 111 degrees today. And I think that, coupled with some work issues, has made The League grouchier than normal. The League admits that The League should not have asked for Loyal Leaguers to apologize. Years ago, The League wasn't going to add a comments section as we anticipated bad behavior cropping up. But you know what? 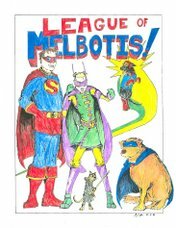 Loyal Leaguers have made The League of Melbotis a lot of fun to work on. As much as The League enjoys shooting his mouth off, he enjoys the comments, jokes and snarky remarks which he can find mere hours after posting. So we hope everyone will continue to participate and keep making this a fun endeavor. But remember, keep it fun. And keep in mind that while all you Loyal Leaguers have thrown your hat into the same ring of justice, we may not all know each other as well as we'd like to. And sometimes that can lead to misunderstanding.